The picture shows a mouse nerve bridge tissue section. The pink colour shows cells that express Robo1, the green colour shows Schwann cells. The research, published in the journal Cell Reports, shows for the first time how the macrophage uses a specific cell signalling pathway to control the processes of nerve repair following damage. 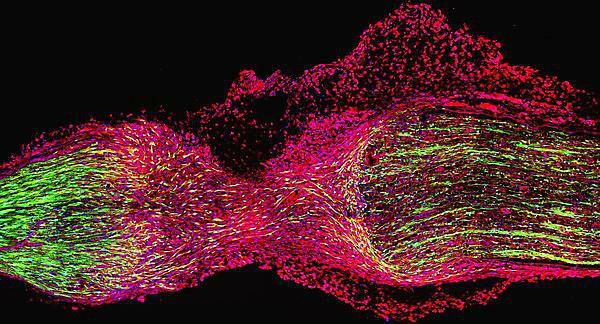 By understanding how it works, scientists hope to develop novel therapeutic approaches to enhance the efficiency of peripheral nerve repair. “Peripheral nerve injuries represent a huge clinical challenge in healthcare. More than one million people worldwide suffer from peripheral nerve damage each year – and our work has exciting potential to help patients to improve the outcome of such injuries. We want to understand the Slit3-Robo1 signalling and utilize it to prepare engineered nerve tissue to boost peripheral nerve repair. So it was really interesting to see the key and novel role of the macrophage, and how its production of Slit3 controls cell migration and the axons’ ‘pathfinding’ in the peripheral nerve bridge. The full study entitled Macrophage derived Slit3 controls cell migration and axon pathfinding in the peripheral nerve bridge is available to view now in Cell Reports (doi: 10.1016/j.celrep.2018.12.081).